Remember this post here where I was prepared and ready to cloth diaper my baby from the day he’d come home? I am sad to update that I have failed my mission but I have learn few things from the day we began our cloth diapering journey. I felt sad everytime we put on the disposable diapers and when I look at those flats and diaper covers being unused. I hate it that we had to buy the disposables every week. Truthfully speaking, I am not a green girl but looking at the trash can full with dipes and wipes really have made me think! I first put on the flats – where I fold them like an insert, and BBH nappy cover to Baby’s bum. I smiled and thought to myself, I can definitely do this! I was really happy looking at how his dipes now in colours and free from chemicals. Since it was my old flats, the size is perfect to the newborn size cover. I was happy experimenting with how many hours can he soaks his flats and the Flip stay dry inserts. With flats, he usually soaks within 1 hour and Flip with 2 hours. If he poops, I’ll change him to new diaper because the covers always get dirty with his blowouts everytime. Lol! I just handwash the covers, easier as we only have two or three rotating daily. 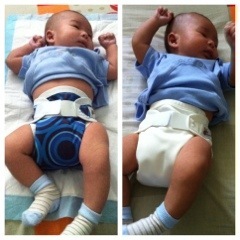 It has been 2 weeks since we started cloth diapering and I enjoy changing his cloth diapers now. Weird, I know! We are still using disposables for his bedtime. I am glad the the disposable packs now last longer as we only use a few daily except when we’re going to my inlaws. 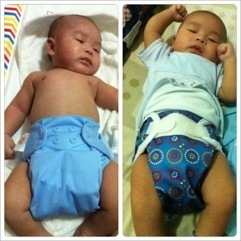 Definitely going to buy wetbags and add more cloth diapers in our stash hehe..